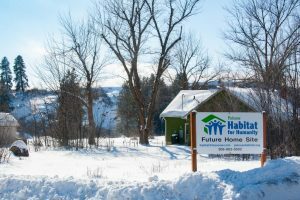 Moscow, ID (April 4, 2019) – Richard and Roberta Kruger have been selected as the Habitat Future Homeowner for the 2019 home, which will be built in Palouse, WA starting this spring. Rick, a retired U.S. Army veteran, works as a seasonal employee with the City of Moscow. Roberta has multiple sclerosis and uses a wheelchair. The couple currently live in an older home in Troy, Idaho which wasn’t designed for wheelchair accessibility. They are looking forward to having an affordable, energy-efficient home designed to meet Roberta’s mobility needs so she can have full access to the home and be able to tackle normal daily tasks such as cooking and doing laundry. As Habitat Future Homeowners, Rick and Roberta will spend 400 hours helping build the home alongside volunteers, participate in financial education and home maintenance classes, save $1000 as a share of closing costs, and purchase the home from Palouse Habitat once completed. A portion of their hours will be contributed by family and friends. The Kruger home will cost $140,000 to build and all support is appreciated. To donate materials or skilled contract work, call 208-883-8502. Financial gifts can be made by mail to PO Box 3054, Moscow, ID or online at palousehabitat.org/donate. To volunteer, email volunteer@palousehabitat.org or visit palousehabitat.org/volunteer. Rick and Roberta were selected based on criteria that included need, ability to make mortgage payments, and willingness to partner in the home build. The Habitat Homeowner Selection committee carefully reviews financial history, conducts credit and background checks, conducted interviews and consults references as part of the selection process. Palouse Habitat for Humanity is the local affiliate of Habitat for Humanity International. It was established in 1992 and has built homes in Albion, Colfax, Pullman, Moscow, Genesee, Palouse, Uniontown and Potlatch. Our mission is to serve our neighbors in need by working to eliminate poverty housing on the Palouse and worldwide. Volunteers build simple, decent, affordable and energy efficient homes for those in need who meet Habitat’s selection criteria. For more information on Palouse Habitat for Humanity and ways to make a difference in our community, visit palousehabitat.org or contact Jennifer Wallace, Executive Director at 208.883.8502 or director@palousehabitat.org.